To make the filling, heat a large saucepan over a medium heat and melt the butter. Add the onion, clelery, leek and mushrooms and cook gently until softened but not coloured, for about 10 minutes. Increase the heat, season the chicken and add to the pan and fry for few minutes until gently coloured. Mix in the flour and cook for about 30 seconds, stirring so it doesn’t stick. Season. Pour in the sherry or Marsala stirring to deglaze, add the lemon juice and stock. Bring to the boil and simmer for five minutes until the sauce thickens and the chicken cooks through. Stir in the crème fraiche, Dijon mustard and herbs. Taste and season. Leave to cool, then chill for a few hours or overnight. Preheat oven to 200ºC / 400°F / gas mark 6, put a large baking sheet in the oven to heat. Remove the mixture from the fridge and stir in the ham chunks. Unroll one pastry sheet and lightly score a 1cm border around the edges using the tip of a sharp knife (don’t cut right through). Brush the outer border with some egg yolk. Spoon the filling into the middle of the pastry and spread to the border. Unroll the second sheet of pastry on top and press the edges together. Brush the surface with egg yolk, then score a pattern on the surface. Sprinkle over the seeds and salt and gently slide the pie onto the hot oven sheet. Bake for 30 minutes in the Aga, on the floor of the Roasting Oven or the preheated oven until the pastry is golden, brown and crisp. 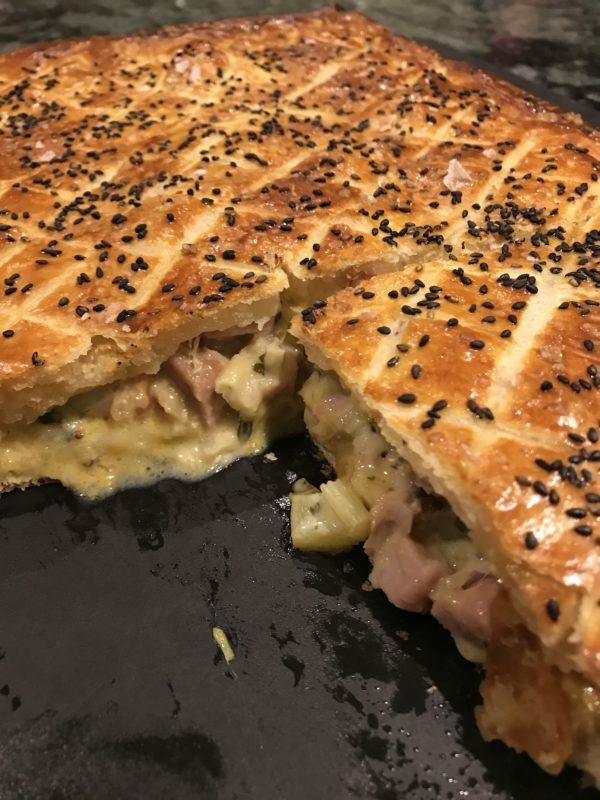 • I use rolled puff pastry fresh or frozen here and there is no wastage of pastry. • The filling is best spread onto the pastry when chilled so I tend to make it the day before I want to use it. • Substitute the chicken breasts for left over cooked turkey and ham from Christmas, a perfect way to use leftovers. Add this at point 5 where you add the cooked ham. You could make it vegetarian by adding some more leeks and mushrooms or make a ham and stilton one. • I make pots of the filling (with no chicken or ham) freeze it and have it to hand to add chicken, cheese, ham etc to when I need a pie.